Monthly Subscription – Customers will be charged once per month for active content.There are a few other restrictions/guidelines outlined on the KDK page as well. So what does this mean? It means altering your perception of the Kindle. If the creativity of the developers of mobile applications on other platforms is any indication (e.g.- Apple, Palm, Google, Microsoft Windows Mobile, Nokia, etc. ), in the next year you will be able to do WAY more on your Kindle than read today’s New York Times and items from your Kindle library. Kindle becomes an already accepted wireless mobile platform with a well-recognized name. It is priced under the bulk of netbooks and many smartphones (admittedly, it also does NOT have touch or color, but I don’t think the designers at Amazon are standing still on those fronts…). This comes as a frontal challenge to the highly anticipated Apple tablet (side thought: if e-readers were THE gadget at CES this year, are tablets likely to be the hot item next year?). As of today (January 25, 2010), it is not public just what the focus and capabilities of the Apple device will be. Apple changed the whole idea of phone as mobile platform and enabled the developers for that device to stretch it and innovate in ways no one foresaw at the beginning (I’m reminded a little of the market for third party add-ons and ActiveX controls to Microsoft Visual Basic and early web development). Apple’s good at drawing its established customer base into the “next big thing/flashy object” and expanding it. I expect to see good sales of their device initially. 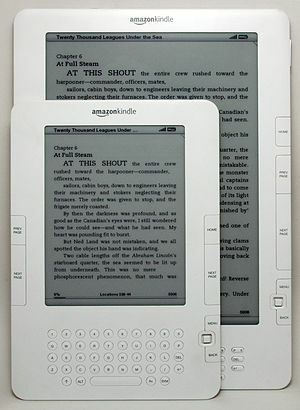 However, Kindle is likely to remain at a price advantage, even if the Kindle v.next has touch and color capabilities. Apple has NEVER been afraid to charge top dollar for its products, and apparently a large portion of the consuming public is willing to pay. However, the growing fuzziness over devices in this area (overlap in function, price, purpose, available applications, etc. for netbooks, e-readers, smartphones and all the ‘tweener’ devices….) may take some time to shake out. Kindle has the advantage of being in the hands of a large number users today, and Amazon is just opening up the device to be enabled in other ways. It’s shaping up to be a very interesting competition. ← My First Video – Can this PLEASE be less painful? I was on the fence for months before I finally decided to order my Kindle 2. I had been reading such mixed reviews about the device and about Amazon’s customer service that I simply could not decide about the purchase. This review is for all of those people, like me, that cannot decide if they need a Kindle 2 for themselves. Well, struggle with the decision no more and ORDER IT! I am so happy with my Kindle 2 and I look forward to reading it every single day. All of the problems that I was worried about are not problems at all. Downloading books is easy, the screen is NOT too dark, the font size is adjustable and the Kindle customer service support is terrific. I had a problem with my Kindle 2 and I was instantly connected with the most helpful representative. I did not have to wait on hold and the problem was solved in no time. I have made the highest recommendations of the Kindle 2 to my friends and family and will continue to do so in the future. I can say with absolute confidence, if you order your own Kindle 2 you will not be disappointed!! !